Angelo Orlando got down on one knee at a grocery store in Saratoga County and handed Kelly Becker a pint of ice cream labeled, "Marry Me Mint." 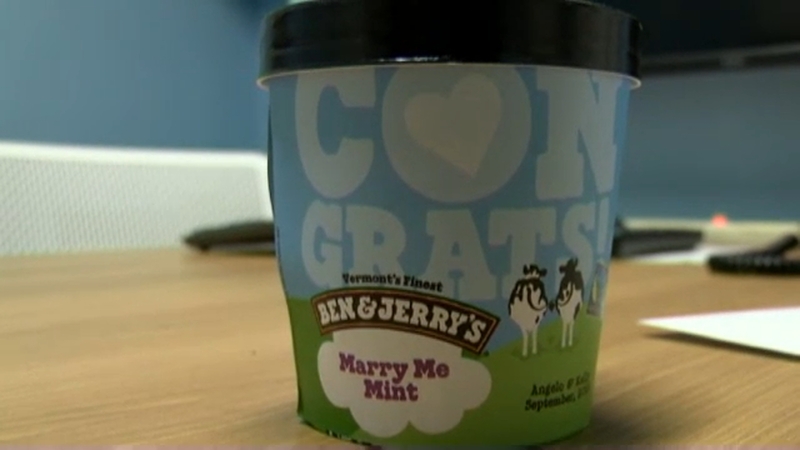 MALTA, New York (WABC) -- A New York man had a little help from Ben and Jerry's to surprise his girlfriend with a sweet proposal in the freezer aisle of their local grocery store. Orlando said he knew Becker's favorite flavor was mint chocolate chip -- so he made up a mock pint. The adorable proposal almost didn't happen. "Everybody got there on time. And everything was staged. I had the pint set, ready to go. And she just did not want to go to the grocery store at all," Orlando said. Becker did finally agree to go and said she was completely surprised by Orlando's gesture. The couple plans to tie the knot next October.